I don't know when I first started getting into tower defense games. What I know for sure is I find them enjoyable now. I like the concept of laying down defenses and having them stop the invading hordes. iBomber Defense Pacific contains a military look and feel to it. We put down machine gun turrets, cannons, flame throwers and more to keep our base safe. 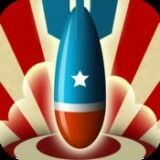 Expect violent images in iBomber Defense Pacific. People are gunned down, tanks are blown up, ships are sunk, and more in iBomber Defense Pacific. The details are actually very good. The maps are diverse as we go across what feels like World War II to me. In the Pacific to be specific. I spent most of my time checking out defenses and planning where upgrades were needed the most. The music in iBomber Defense Pacific has a military appeal to it as well. I did get tired of hearing the machine guns and cannons going off over and over again. Thankfully there are brief interludes between the multiple waves of enemies. They do eventually stop coming in case you begin to think they are rather endless. There are enough levels, modes, and difficulty settings to warrant the price, especially if you like tower defense games. iBomber Defense Pacific works on the iPhone, iPod Touch and iPad. The purchase grants the owner a universal application. Which is great for families with more than one of those devices. The game play is one of the areas iBomber Defense Pacific shines. Some tower defense games open things up and let you use anything, anywhere. iBomber Defense Pacific only allows certain spots to be used. This means real thought needs to be put into where to put the defenses. The enemies will come from multiple paths so that also goes into the thought process.